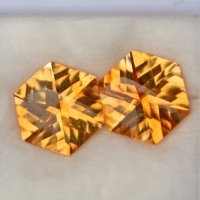 Citrine is the yellow, golden yellow, golden orange and reddish orange variety of quartz. In 1556 a German metallurgist Georg Bauer known to some as the "father of modern mineralogy" named yellow quartz "citrine" in a publication about gemstones and jewelry. Bauer realized the value in name marketing and the name "citrine" has been used since. The most likely root of the word citrine is from the old French word for yellow-citron-or the Latin word citrus for the color of citrus for the color of citrus fruit. 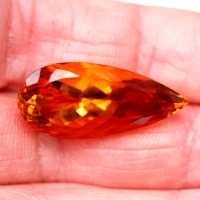 Historically citrine has been known for thousands of years. Some biblical scholars feel that citrine fits the description of the tenth gemstone of twelve stones in Aron's breastplate as found in the book of Exodus. 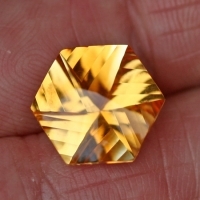 In ancient Greece citrine was popular as a decorative gem. In the 17th century Scottish weapon makers placed citrine on dagger handles, sometimes using a single large citrine crystal as the handles themselves. Citrine became a popular gemstone for traditional kilt pins and shoulder brooches mainly due to Queen Victoria's fascination with the gem. In the early 20th century during the Art Deco period citrine again rose to prominence as a much desired gemstone. Citrine is know as the lucky "Merchants Stone". 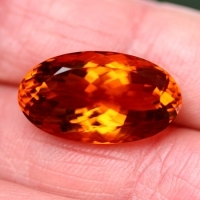 If you are in sales place a citrine in the cash drawer and see what happens. Opens the mind to new thought. Cleanses, purifies and eliminates poisons that have built up. Gives joy and love to the owner. All citrine has been heated to obtain their color Whether by man or by natural geothermal processes. Citine is a hard durable gemstone that is not only affordable but is a good choice for all types of jewelry. Extra fine grade gemstones from Brazil. 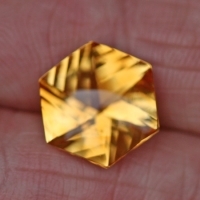 Extra fine grade gem citrine from Brazil. Extra fine quality gemstone from Brazil. Fine grade gemstone from Brazil.